We are engaged in offering Metrology Lab Equipments. 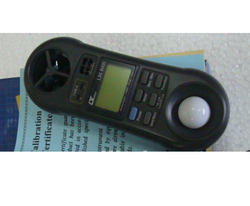 Portable weather station, you can measure all environmental conditions like temperature, wind speed, heat index etc. 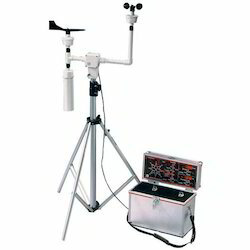 Our portable weather station can be held in hand and it is not difficult to carry it along. A Wind Vane also known as weather vane is an instrument for showing the direction of the wind. Our organization is engaged in supplying Metrology Instruments. These devices are of renowned manufacturers like Carl Zeiss Germany. We assure that these metrology instruments are upgraded using latest technology. We supply our products mainly in Ludhiana and nearby regions in Punjab. Meteorology is the study of flow patterns in our surroundings & the various related physical properties. It deals with weather, its fluctuations & the climate. Due to extreme urbanisation and industrialization, the weather conditions are changing rapidly, causing severe concern to mankind. Combating the rapid change in weather is the biggest challenge for 21st century scientists. Automatic Weather Stations, Radio Remote Telemetry systems, Satellite based telemetry systems, Satellite data acquisition systems, Temperature, Humidity, and Liquid Water Radiometers, Weather Radars, Wind Profiling Radars, Lightening detection, Decision support systems and Now casting systems. Optical flats comes with diameters of 25, 50, 75 &100mm. Thickness of 8, 12, 18 & 25mm. Accuracy of 0.1 µ.
Convex of Dia. 50mm, & Thickness 12mm.Concave of Dia. 50mm & Thickness 12mm.Cylindrical of Dia. 50mm & Thickness 12mm.Tourf / Valley of Dia. 50mm & Thickness 12mm. We can take up design, fabrication, galvanizing, supply, foundation and erection of Meteorological Towers, Masts and Poles with high quality of workmanship at reasonable prices.